Not all of the athletic prowess in this university is centered in the varsity team athletes. In the R.O.T.C. department there are six enlisted men who have athletic records of no mean caliber. 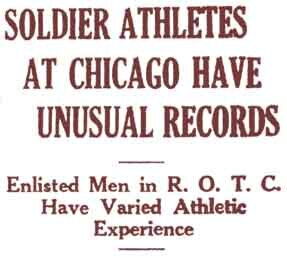 These men have played on military post teams and a few of them have even invaded the professional fields, and at the present time they are stationed at the University of Chicago. The outstanding of these military athletes is one T. Van Deusen, Private who was light heavyweight boxing champion of the Phillipine Department and China in 1924 and 1925 -- Captain of the Fort Mills swimming team in Orient games at Manila in 1925 -- Captain of the Presidio of San Francisco swimming team in 1926 -- Right Tackle on the Jefferson Barracks football team in 1926 -- Captain and Left Half of the Ft. Slocum N.Y. Team in 1927 -- and fought professionally under the long time of "Tiger Bell" in 1926-17.